How Many Missions Has the US Military Carried Out in Africa? No One Knows For Sure. The military continues to downplay its numbers in Africa while US taxpayers cover the rising costs. Sometimes, the real news is in the details—or even in the discrepancies. Take, for instance, missions by America’s most elite troops in Africa. It was September 2014. The sky was bright and clear and ice blue as the camouflage-clad men walked to the open door and tumbled out into nothing. One moment members of the US 19th Special Forces Group and Moroccan paratroopers were flying high above North Africa in a rumbling C-130 aircraft; the next, they were silhouetted against the cloudless sky, translucent green parachutes filling with air, as they began to drift back to earth. 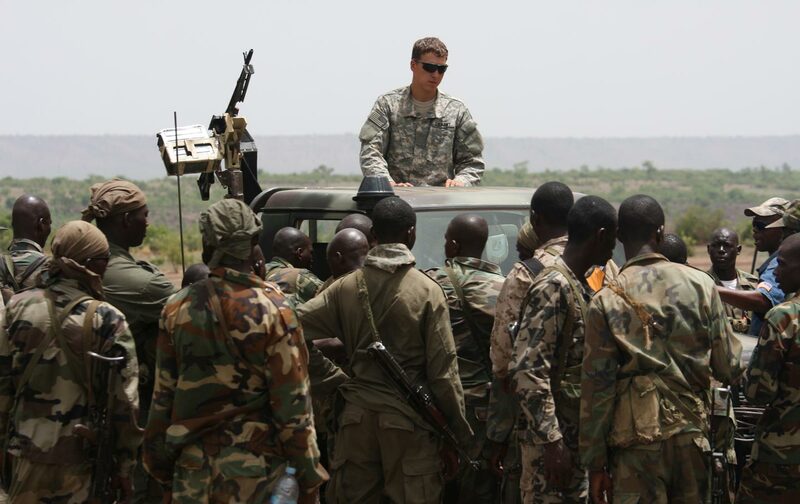 A key way the US military has deepened its involvement on the continent, JCETs have been carried out in an increasing number of African countries in recent years, according to documents recently obtained by TomDispatch via the Freedom of Information Act (FOIA). When it comes to US troops involved, foreign forces taking part, and US tax dollars spent, the numbers have all been on the rise. From 2013 to 2014, as those recently released files reveal, the price tag almost doubled, from $3.3 million to $6.2 million. These increases offer a window into the rising importance of such missions by US Special Operations forces (SOF) around the world, including their increasingly conspicuous roles in conflicts from Iraq and Syria to Yemen andAfghanistan. On any given day, 10,000 special operators are “deployed” or “forward stationed” conducting overseas missions “from behind-the-scenes information-gathering and partner-building to high-end dynamic strike operations”—so General Joseph Votel, at the time chief of Special Operations Command, told the Senate Armed Services Committee in March. Through such figures, the growing importance of the US military’s pivot to Africa becomes apparent. The number of elite forces deployed there, for example, has been steadily on the rise. In 2006, the percentage of forward-stationed special operators on the continent hovered at 1%. In 2014, that number hit 10 percent—a jump of 900 percent in less than a decade. While JCETs make up only a small fraction of the hundreds of military-to-military engagements carried out by US forces in Africa each year, they play an outsized role in the pivot there, allowing US Africa Command (AFRICOM) to deepen its ties with a variety of African partners through the efforts of America’s most secretive and least scrutinized troops. Exactly how many JCETs have been conducted in Africa is, however, murky at best. The documents obtained from US Special Operations Command (SOCOM) via FOIA present one number; AFRICOM offers another. It’s possible that no one actually knows the true figure. One thing is certain, however, according to a study by RAND, America’s premier think tank for evaluating the military: The program consistently produces poor results. The 2014 SOCOM documents TomDispatch obtained note that, in addition to conducting JCETs, US Special Operations forces took part in the annual Flintlock training exercise, involving 22 nations, and four named operations: Juniper Shield, a wide-ranging effort, formerly known as Operation Enduring Freedom-Trans Sahara, aimed at Northwest Africa; Juniper Micron, a US-backed French and African mission to stabilize Mali (following a coup there by a US-trained officer) that has been grinding on since 2013; Octave Shield, an even longer-suffering mission against militants in East Africa; and Observant Compass, a similarly long-running effort aimed at Joseph Kony’s murderous Lord’s Resistance Army in Central Africa (that recently retired AFRICOM chief General David Rodriguez derided as an expensive and strategically unimportant burden). US Special Operations forces conducted 20 JCETs in Africa during 2014, according to the documents obtained from SOCOM. These missions were carried out in 10 countries, up from eight a year earlier. Four took place in both Kenya and Uganda; three in Chad; two in both Morocco and Tunisia; and one each in Djibouti, Niger, Nigeria, Senegal, and Tanzania. “These events were invaluable training platforms that allowed US SOF to train and sustain in both core and specialized skills, while working hand-in-hand with host nation forces,” say the files. African forces involved numbered 2,770, up from 2,017 in 2013. The number of US special operators increased from 308 to 417. In testimony before the Senate Armed Services Committee in March, the incoming commander of SOCOM, General Raymond Thomas III, laid out a sweeping vision of the “US strategy in Africa.” It included “neutralizing Al-Shabaab in East Africa” and empowering Somalia’s government to do the same; “working with our African partners in North and West Africa to ensure they are willing and capable of containing the instability in Libya, degrading VEOs [Violent Extremist Organizations] in the Sahel-Maghreb region, and interdicting the flow of illicit material,” as well as working with African allies to contain Boko Haram and empowering Nigeria to suppress the terror group. In addition to troubling overall trends in Africa since the US pivot there, JCETs have come under special criticism. A 2013 report by the RAND Corporation on “building partner capacity” (BPC) cited several limitations of the program. “US forces cannot provide support to partner equipment under JCETs and cannot conduct dedicated training in advanced CT [counterterrorism] techniques (and hence cannot conduct planning for BPC),” it noted. Ultimately the RAND study, which was prepared for the Pentagon’s Joint Staff and the Office of Cost Assessment and Program Evaluation in the Office of the Secretary of Defense, found “moderately low” effectiveness for JCETs conducted in Africa. In an e-mail, SOCOM spokesman Ken McGraw said he didn’t have the time to review the results of the RAND study and refused to offer comment on it. The US military either can’t or won’t come to a consensus on how many missions have been carried out by its most elite troops in Africa. Incredible as it might seem, given that we’re talking about an organization that notoriously can’t keep track of the money it spends or the weapons it sends to allied forces or even audit itself, it’s entirely possible that no one actually knows how many JCETs—and as a result how many special operations missions—have been carried out on the continent, where they occurred, or what transpired during them. With independent analyses showing armed violence and terror attacks on the rise in Africa, the Pentagon’s center for the study of the continent showing terrorism fatalities spiking, and the commander of America’s most elite forces in Africa acknowledging a proliferation of terrorist groups there, perhaps it’s no surprise that the US military isn’t interested in looking too closely at its efforts over the last decade. Experts, however, say that keeping the American people in the dark is both dangerous for democracy and a threat to effective overseas US military engagement.